Just in time for early holiday shopping, Sckoon Organics has introduced an adorable collection of huggable, soft, organic plush and organic knit pals. Each Sckoon organic animal friend (rabbit, dog, elephant or baby lion) is made with 100% certified organic cotton inside and out, and is dyed naturally with soothing color dyes that are low impact, metal-free, and eco-friendly. Made in India under Fair Trade standards, Sckoon organic animals are packaged in a beautiful, reusable gift box — making these cuddly friends a convenient, green holiday present. Just in time for early holiday shopping, Sckoon Organics has introduced an adorable collection of huggable, soft, organic plush and organic knit pals. Each Sckoon organic animal friend (rabbit, dog, elephant or baby lion) is made with 100% certified organic cotton inside and out, and is dyed naturally with soothing color dyes that are low impact, metal-free, and eco-friendly. 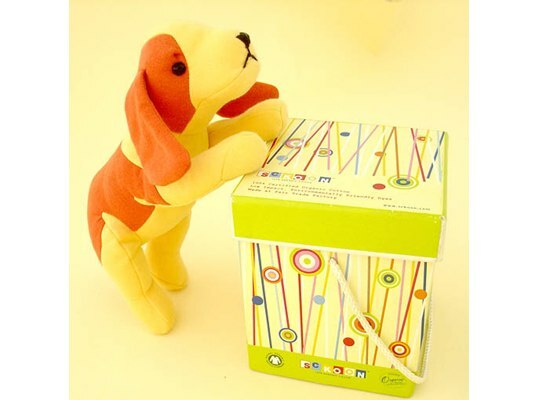 Made in India under Fair Trade standards, Sckoon organic animals are packaged in a beautiful, reusable gift box -- making these cuddly friends a convenient, green holiday present.